Instagram was initially purely a photo -sharing app and service, but in June 2013 Instagram incorporated 15-second video sharing. In March 2016, three years later, Instagram increased the 15-second video limit to 60 seconds because they realized that the limit of 15 seconds limited people’s creativity and prevented users from sharing the type of videos that people wanted to share on the platform. What’s most interesting when it comes to videos on Instagram is that initially, it was a photo-sharing app only, but today, apart from just allowing you to share videos as regular posts, there are now several video-sharing features that allow you to share different types of videos, and thus of different lengths. In this article, I’ll be answering the question ”how long can an Instagram video be?”, not by only talking about how long a video can be if you share it as a regular post on Instagram, but rather how long an Instagram video can be on all the different video features that are available on the platform. Let’s dig right in. Now, let’s dig into these different video types and their maximum respectively minimum length on Instagram. When the video-sharing feature on Instagram was first released in 2013, the maximum length of a video on Instagram could be was 15 seconds. In March 2016, however, Instagram increased the 15-second video limit to 60 seconds. Furthermore, in February 2017, Instagram introduced albums, also known as carousels or “multiple posts”. What this meant is that users could upload 10 unique pieces of content in one single post which users can swipe between. In uploading an Instagram slideshow, you can upload only photos, only videos, or both. As such, since the maximum number of posts is up to 10, you can thus, technically upload 10 videos that are all 60 seconds, which means that you can upload a total of 10-minutes worth of video in one single post on Instagram. This is great news if you want to tell a story with your Instagram video post but need a longer video to convey your message and tell the story. Learn more about using Instagram carousel here. The shortest a video can be when uploading a regular post is 3 seconds. This makes sense because if it would be shorter, you wouldn’t be able to showcase anything and it would be better to just upload a photo. The lengths 3-60 goes for if you both record a video directly in-app or if you upload a previously created video. A video on Instagram Stories can be a maximum of 15 seconds long. This is, of course, unless it’s a live video, which is built-in inside of the Stories feature. If you have a long video which is longer than 15 seconds and want to upload it to Instagram Stories, what can you do? Simple. Simply split your longer video in 15-second clips and then upload them one-by-one. There isn’t really a limit to how short a video can be on Instagram Stories, so it will be 1 second. 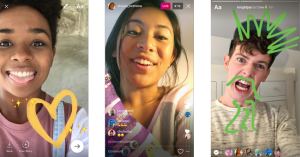 The longest a live video can be on Instagram is 60 minutes, Once you’ve reached this 60 minutes, you can, of course, directly start broadcasting another live video thereafter. There isn’t a limit to how short live videos can be as you decide when you are going to stop broadcasting. IGTV was released in June 2018 and allows you to upload videos of up to 10 minutes in length. These can have a file size of up to 650 MB. If you, on the flip side, are a verified and popular user, you are allowed to upload videos of up to 60 minutes in length. These can have a file size of up to 5.4 GB. From initially having been only a photo-sharing platform, Instagram has come a long way in diversifying its content types, especially when it comes to video content. Instagram understands that video is an important market in order to expand, and they work hard to win over their competitors which are right now dominating the video space, which mainly is YouTube, including a number of other competitors. Are you using video features on Instagram? Do you upload mostly videos or photos on Instagram? Let me know below, I’d love to hear about it! PrevIs There a Way to Unlink Your Phone Number From Your Instagram Account?